Fully online courses are more likely to drive enrollment growth, according to a recent survey of institutions from Quality Matters and Eduventures Research, the research division of ACT/NRCCUA. Most respondents said that courses that were 100 percent online at their schools had grown between 2017 and 2018; about a third reported flat enrollment; and 10 percent saw a decline. 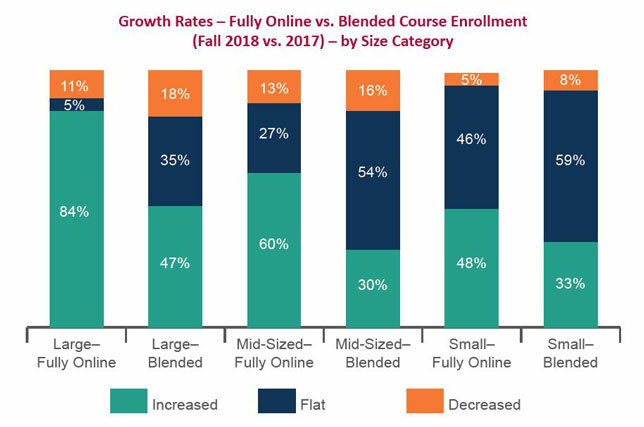 The majority response for blended courses, on the other hand, was flat enrollment over that period, while a third cited growth and 14 percent recorded a decline. The schools that reported completely online courses had an average of 19,000 students, while those that reported that all of their courses were blended or hybrid reported an average of 5,000 fully online and blended students. "Blended intensity" didn't have the same link to institutional size, researchers noted, most probably because blended courses were "more difficult to scale up geographically." The institutions with the largest online enrollment were also the most likely to report growth (84 percent) compared to mid-sized, where 60 percent experienced growth, and small, where 46 percent saw growth. The researchers suggested that this was a signal that in "an increasingly crowded online market," those schools with the most online offerings and years of delivery were also "more visible to consumers" and might "offer a superior online student experience." It could also indicate, the report added, that those smaller institutions weren't as keen "to ramp up online enrollment above a certain scale." Fully online courses were far more common among respondents than blended. More than 20 percent of reporting schools said most of their courses were online; just 8 percent reported the same for their blended courses. 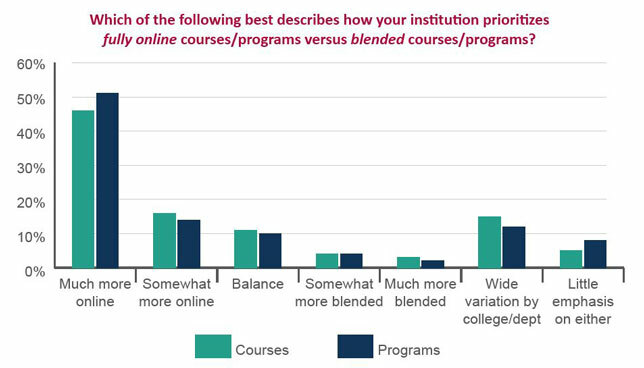 In fact, half of the reporting schools gave much higher priority to fully online courses and programs than they gave to their blended offerings. Their planning also emphasized fully online options over blended versions. Master's degrees were the most fully online programs, according to the survey, and about a third of all master's students study in a fully online program, which is considerably higher than any other degree level, the report said.